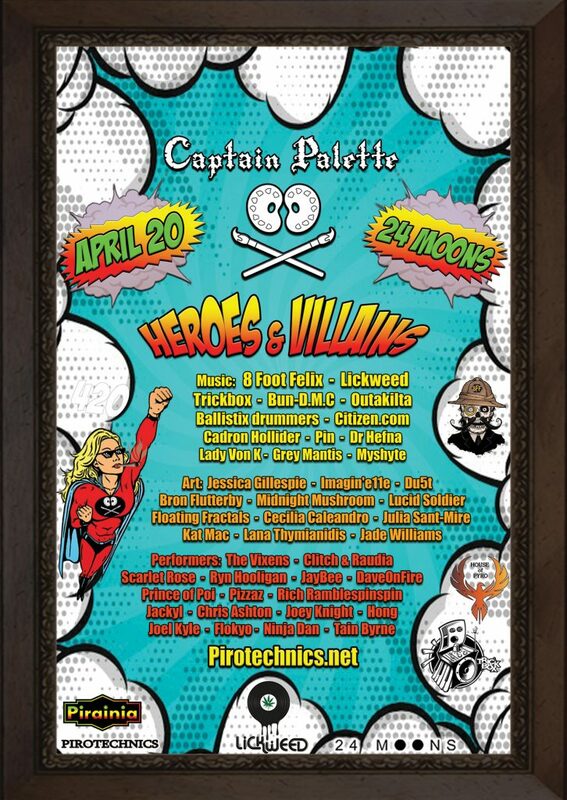 Join us on the epic date of 4/20 (April 20) for a special Heroes & Villains theme, Captain Palette 4th Birthday celebration. Super 420 special $4.20 – SOLD OUT! Joint Tickets special $10 – SOLD OUT! Early bird $15 – SOLD OUT! Plus the biggest fire, glow & burlesque performer line up Captain Palette has ever seen! Showcasing Partner Fire Eating, Pole Dancing, Hoops, Rope Dart, Dragon Staff, Poi, Double Staff & more! Plus a special surprise international guest perfromer! Dress theme: Heroes & Villains! Get creative, Dress up & unleash your inner superhero or villain.